The average San Antonio Rampage tickets price will cost you between $31 and $72, if you are looking for the cheapest seats then catch the event being held at the AT&T Center, San Antonio on 12/04/2019. The average ticket will cost you the highest on 13/04/2019 at the HEB Center at Cedar Park, Cedar Park. Minimum get in price is for San Antonio Rampage tickets is $7 for the event being held at the AT&T Center, San Antonio on 12/04/2019 , there are some venues that have a much higher get in price, for instance the cheapest seats at the HEB Center at Cedar Park, Cedar Park on 13/04/2019 will set you back $39. AT&T Center in San Antonio is going to witness a rampage this season. That's right, San Antonio Rampage is playing and these are the games to be at! Rampage has a history of some great season turn outs and some not-so-great but whatever the game; fans get to watch some real thrill. The team's owner is NBA's San Antonio Spurs and is as talented as its affiliates, Spurs and Florida Panthers. The two teams also share the same home ground. San Antonio Rampage was originally called Stampede but the name was changed in 2002. However, whether the team is Rampage or Stampede, its performance is always excellent. Fans have a great time at every game. It's always better to watch Rampage from the stands rather than sitting on the couch and watching it on the dull, old TV screen. The best part about Rampage is that the team is always developing therefore every new season brings a new side to their performance. Then no matter how the season turns out, the games that follow are some really excellent ones. Whether you want exciting or extreme, you can get it at a Rampage game. The team plays with great gusto every time to make it to the playoffs and they have a roster to justify their performance. So wait no more and get your hands on San Antonio Rampage tickets. The team has some real heavy fan base that will be buying tickets like crazy. Make sure you're one of them. How to get the san antonio rampage tickets discount? 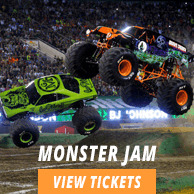 Some of the rampage cheap tickets listed on your website are marked as will call. Can you tell me what is this and how it works? Do you have good san antonio rampage tickets? Will Call tickets can be collected directly from the venue. Most event venues have a special section of the box office known as the 'will call' window. It is at this window that you can pick up your San Antonio Rampage tickets on the day of the event. In order to get discount on the San Antonio Rampage Tickets, you need to know the discount code which can be used at the time of purchase. Yes, we have a huge inventory of premium tickets to San Antonio Rampage.